Why do designers put furniture on angles? The best reason to put furniture at an angle is because you already have an existing angle in the room. You may need to highlight that feature (usually a fireplace) or the flow may simply work better because the architecture dictated it. Other times, there may be a window that is not properly offset (builders get a little crazy) and there’s not enough room for a properly sized bed or sofa. Since there’s almost nothing worse than a piece of furniture only being half under a window, angling the furniture may overcome this obstacle. Finally, angled furniture may help create better flow in a room. Particularly in square or skinny rectangular rooms, a large piece of furniture may take up too much real estate. An angle may allow for better movement in the room, or soften the hard lines of the back of a sofa or chair. Unfortunately, what we often see in before & after portfolios are home after home, room after room, with nearly ever stick of furniture on angle. Please stop! The average person prefers straight placement of furniture. PERIOD. Angles used without purpose don’t provide “Wow factor”. They provide, “really, that’s all you’ve got up your sleeve?” factor. Seriously, furniture on angles should be used as a last resort. When looking through portfolios, or photo galleries, the first thing that strikes you about the space shouldn’t be that the sofa or rug is on an angle. It should be your eye was drawn to the space or focal point. I’ve included some photos of some staged rooms where angles were done right. The fact that the furniture placement was on an angle, probably wasn’t even immediately obvious to you (except for the fact that this post talks about angled furniture). The hallmark of an exceptional room is when the whole room captures your attention, not just a single part of it. All of the items, placement and flow work together in perfect harmony. A well placed arrangement works as a harmony, not a solo. Photo credits: featured image by Prep This House. 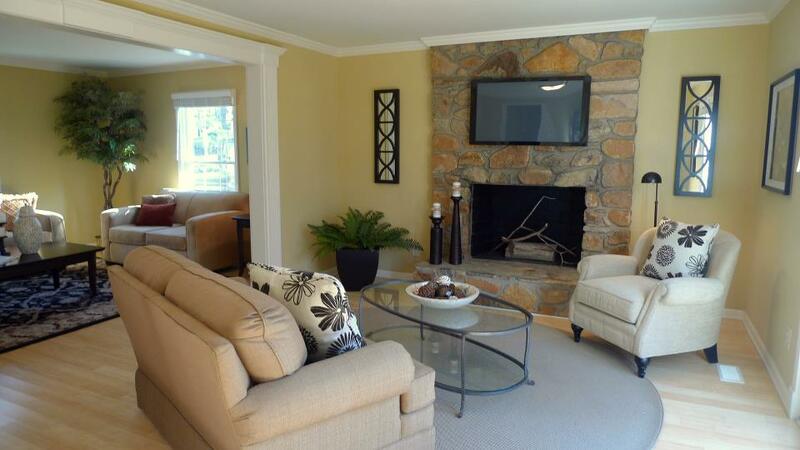 Angled fireplace room staged by Stage to Sell. Traditional living room by Triangle Staging & Design. 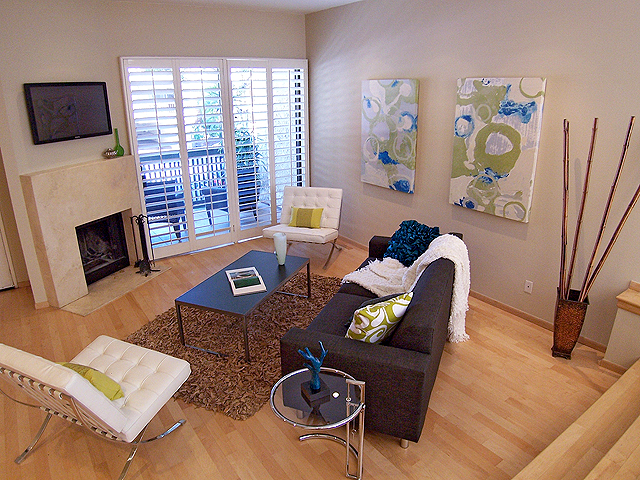 « Becoming a Home Stager: Running a Successful Home Staging Business Part 3: What’s the Plan? Thank You. Thank You. Thank You…for highlighting this phenomena. As someone who works both sides of the pond this is mainly a USA/Canadian trait as in the UK we often don’t have the space to angle even if we thought it was needed!!. I do teach in class that this can be a solution to angled architectural features and show examples. I understand that often it is the only solution for a weird builder angle but it’s interesting that the shots I use to illustrate this point all come from the USA as I find it difficult to find UK examples. I agree that the average person prefers straight placements, angles seem to subliminally unsettle people. It’s a weird thing. I see it all the time and I just know that within a short amount of time that the homeowners will have moved their furniture back. It’s just not functional or a feel good move for most people. I absolutely love angled furniture. for years I thought it was just my personality. I have tried squaring furniture up but it becomes a box to me and really doesn’t accentuate anything in the room. I feel an angled room is much more inviting.